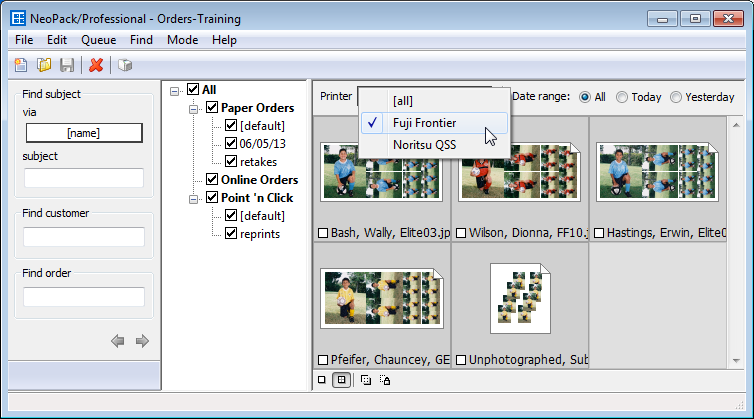 Version 4.3 introduced a new mode - Queue Mode - where the operator has enhanced functionality when printing products. 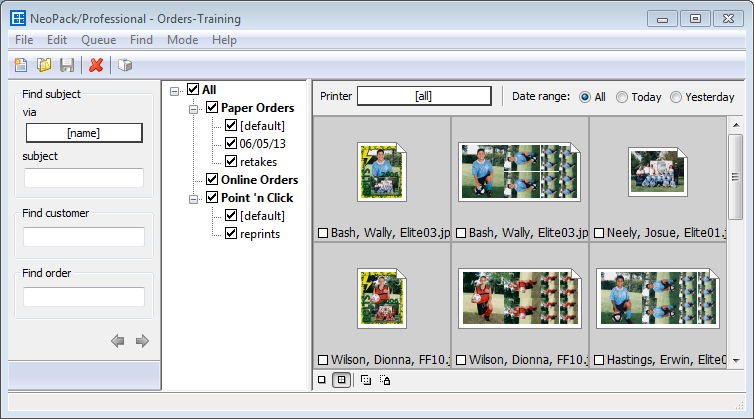 The new Orders Tree provides an easy, visual method for selecting the products for printing. The Paper orders branch includes any Order Sets as defined in Orders Mode as sub branches. Checking the Paper orders object automatically checkes any Order Set branches. The Online orders branch displays orders downloaded from the Timestone Internet Ordering System. Online orders do not have sub-branches. Orders added manually in Point 'n Click Mode (formerley Form Packs Mode) are displayed in the Point 'n Click branch. Strictly speaking, pages added to directly to Form Packs Mode are not orders. They are not part of subject or customer data, do not receive an order key and do not appear in reports. Sub-branches display any queues that have been added in Point 'n Click Mode. Once the desired the order branches have been selected it is possible to further refine the products displayed. 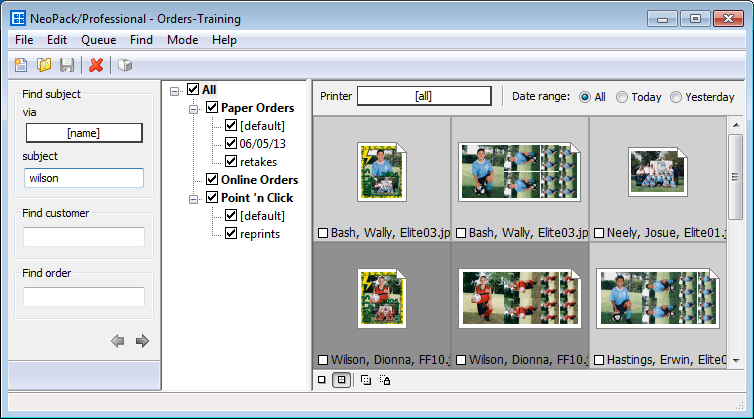 If products have been defined with a 'Printer' in tsAdmin (see Product attributes) it is possible to filter the orders for a particlular printer. Products displayed may also be filtered by date. In summary three levels of filtering are available to control the products displayed. The primary selection is via the Order Tree - check the desired branches to display products from those orders only. This selection may then be further refined by making use of 'Printers' and 'Dates' filters. Once orders have been filtered as above it is possible to search for products within the currently displayed products. It is important to note the search facilities will only find products if they are in the group of products currently displayed. For example if the order tree only has 'Point 'n Click' orders checked, the search will not find any products in the Paper Orders branch. Products may also be found via menu items and keyboard shortcuts in addition to the Find windows. Only Point n Click pages may be deleted in Queue Mode. Pages resulting from Paper Orders or Online Orders cannot be deleted (this would result in 'orphan' orders with no products with implications to reports, statistics etc).